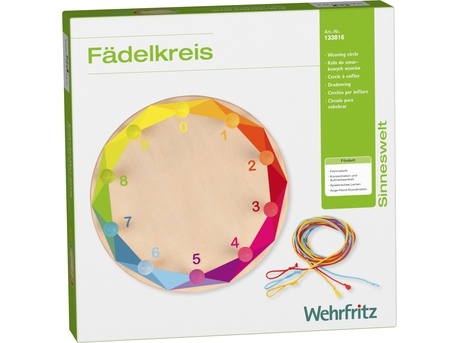 The colorful robust weaving circle is a fun way to teach children learning content and to support fine motor skills, hand-eye coordination and concentration. 0, 3, 6, 9, 12, 15, 18 … Each number sequence in the tables from 1 to 10 becomes a clear, symmetrical pattern where children can check by themselves if it is correct. Great shapes and figures can be woven, even without numerical skills. Whilst doing so, children intuitively acquire first knowledge of figures. 1 weaving circle, 3 weaving strings. Contents: 1 weaving circle, 3 strings. Material: birch, solid wood. Dimensions: Ø 18 cm, H 3 cm, strings (red, yellow, blue) approx. 15 cm.